(CNN) -- Long-serving defender Sami Hyypia is to leave Anfield and join Bundesliga Bayer Leverkusen at the end of the season. Hyypia celebrates one of the 35 goals he has scored for Liverpool. The 35-year-old Finnish international has been at the Premier League giants since 1999 after signing from Dutch side Willem II for $3.73 million. Hyypia formed a watertight central defensive partnership with Swiss Stephane Henchoz and was a key member of the Liverpool side which won three trophies in the 2000-01 season. He was also in the Liverpool team which famously won the Champions League in 2005 as they came from three down to beat AC Milan on penalties in Istanbul. The Finn had scored a crucial volleyed goal in an earlier tie with Juventus as the Reds battled to another European triumph. Hyypia will link up with Bayer in the summer and has signed a two-year deal with the German side, the official Liverpool Web site www.liverpoolfc.tv said. 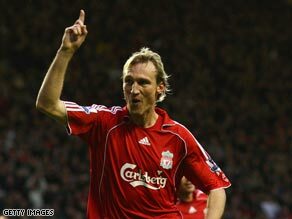 Hyypia played a remarkable 57 straight Champions League games for Liverpool from 2001 to 2006. But the arrival of young center backs such as Daniel Agger and Martin Skrtel has seen Hyppia lose his regular starting place as Liverpool push for the Premier League title. Hyypia has scored 35 goals in 463 appearances for Liverpool, including one in 12 starts this season.